Crochet time has been extra squeezed lately as we are trying to do lots of jobs in preparation for building work. However, a nasty bug last week left me feeling a bit too poorly to do many larger tasks so I did get a bit more craft time than I had planned whilst I recovered. Mr C treated me to some yarn to cheer me up, because being ill makes me grumpy! 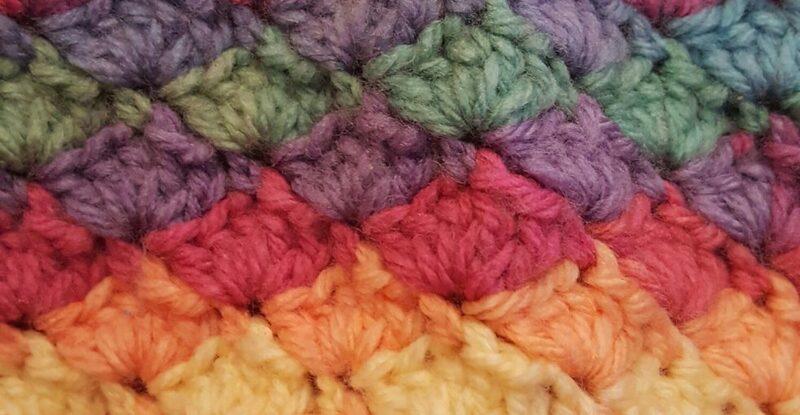 It was one of the yarn cakes from Aldi, and I chose the sunrise colourway as the shades really appealed to me. After a lot of Google searches loosely based around ‘what can you make with one yarn cake?’ I settled on this really simple scarf pattern, which tapers at each end and has some lovely tassels to complete it. I’ve worked up to the decreases and left it for now, as I know I will need to concentrate so I don’t mess up the stitch count. When I have a full evening of crochet time I will crack on with it and hopefully get it done in one sitting. One thing I love is how the colour changes are long so you get a good section of each colour, but no knots or fiddly ends to sew in. However, the yarn is quite scratchy and rough. I will try and wash the scarf (before adding tassels) with fabric conditioner to see if it softens. (I know the fact it was fairly cheap means I can’t expect it to be especially soft.) I’m glad I tried using a yarn cake though-I will be buying more in future, but will purchase better quality ones. What are you working on this week? Do you have any suggestions for softening rough yarn? Thanks, much better. I enjoyed using the yarn cake, at least enough to buy a better quality one.